“My dear Kepler, I wish that we might laugh at the remarkable stupidity of the common herd. What do you have to say about the principal philosophers of this academy who are filled with the stubbornness of an asp and do not want to look at either the planets, the moon or the telescope, even though I have freely and deliberately offered them the opportunity a thousand times? Truly, just as the asp stops its ears, so do these philosophers shut their eyes to the light of truth.” – Galileo Galilei to astronomer Johannes Kepler. How did Galileo’s peers manage to deny the undeniable for so long? By playing the same dopamine games that help today’s intellectuals (and dummies) deny that our species is flirting with self-annihilation. Ignorance might not be bliss, but self-deceptions and denial do help provide the only payoff that DIMwits, like all apes, are interested in — protecting and triggering dopamine flow. Self-deceptions protect us from what we dread most — the dopamine deprivation associated with facts that increase fears, reduce peer approval, or threaten esteem. Denying the countless, growing, and possibly insurmountable problems facing humankind makes it possible to ignore the existence of a widespread brain disease responsible for all the problems. What Galileo couldn’t know was that, by refusing to look through his telescope, his detractors were doing what DIMwits do all the time, i.e. protecting their dopamine flow by playing popular dopamine games. Dopamine games seem illogical, irrational, and/or foolish because they’re never about logic, reason, information, or facts, and always about triggering dopamine and/or protecting dopamine flow against the threats posed by logic, reason, information, and facts. The trick to playing I Don’t Believe What You’re Saying Because I Don’t Want To Know is to substitute flimsy deceptions for the words “I don’t want to know.” In the 17th century, Galileo’s critics refused to peer through his telescope because they convinced one another the astronomer was using his suspicious contraption to fool fools. Only simpletons would ignore a man shouting, “Fire!” because they found the information too depressing, they disliked the guy, they couldn’t admit they were afraid of fires, and/or they were annoyed by his attitude. Yet, when it comes to learning about dopamine, even dopamine experts play IDBWYSBIDWTK. Why? 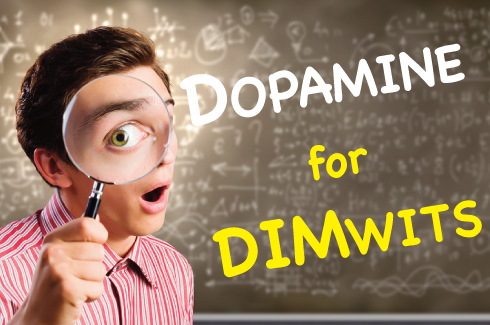 IDBWYSBIDWTK offers a proven strategy to protect dopamine flow. And the only requirement is the ability to hide behind transparent rationalizations. Additionally, canny players score bonus dopamine squirts by deluding themselves into believing they’re too smart to be fooled, when it’s obvious they’re fooling themselves. I’m an Optimist!, a clever variation of One-upmanship, is based on an array of deceptions. The first falsely equates the ability to deny unpleasant information with optimism. The second is the misconception that the bearers of unpleasant information are fear-mongers / alarmists / defeatists / pessimists. The third is that optimists are inherently smarter, nicer, and/or superior to pessimists. I’m an Optimist makes it possible for both brilliant and doltish players to dodge dopamine repellent information while scoring dopamine squirts triggered by artificially inflating their esteem. It explain all the thing i want understand since i was a teenager. But now we know all thing/thought bring us dopamine and it s our motor of life what live to live?when we know this we begin to be aware that there no right way and finaly no choice! What s natural and healthy life for an human,what s human life if it exist! When i understand your text for me i think it s impossible to escape the dopamine rules.